Giving words to a visual experience or art writing is amusing. Words can be as abstract – or as direct – as visuals. When we bestow a title, label or a name to an idea or expression, we reify it. We start exerting power over it. We limit it. 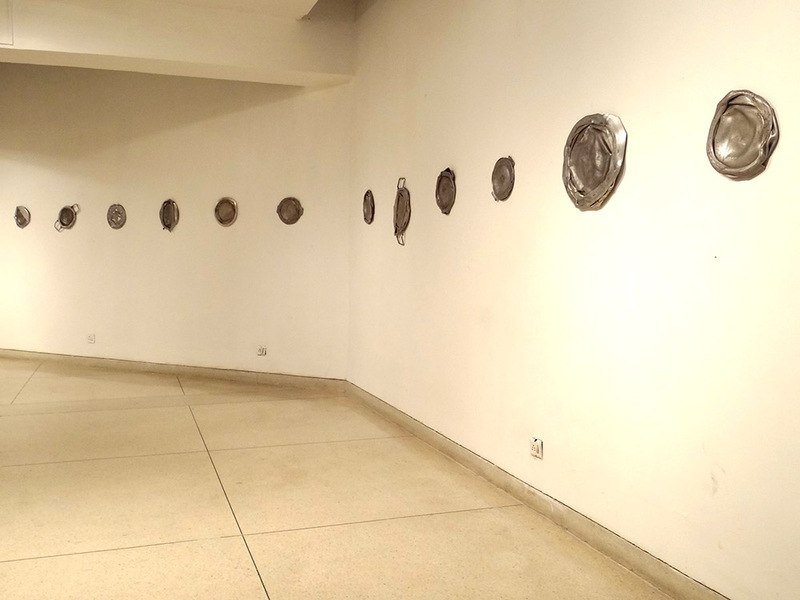 A recent two-person show by Hifsa Farooq and Sara Aslam (September 18 – September 26, 2018) at the Alhamra Art Gallery, Lahore, was without a title and many of the works on display were nameless. The two artists bring together an unconventional, unassuming ensemble at a public institution in Lahore. Their narratives were crisp and invigorating. Both artists have received their academic undergraduate art training at the School of Visual Arts and Design (SVAD), Beaconhouse National University (BNU), Lahore. 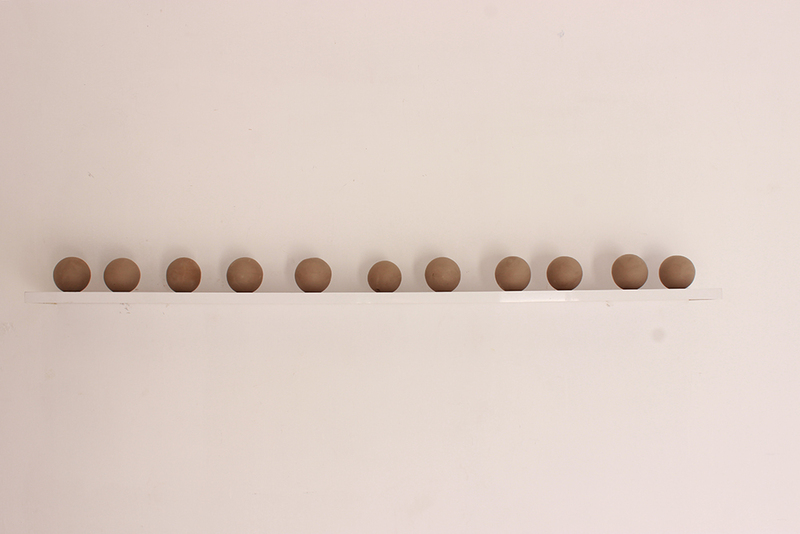 SVAD-BNU, over the years, has managed to bring a fresh approach to visual arts in Pakistan by questioning and dismantling many previous conventional modes and means of artistic production. It has encouraged alternate materials of creative expression and nurtured cross-media approaches to making. Clearly this ethos was evident in the artists’ work on display. An object is a thought, a suggestion or a memory. What one needs from an object is what defines it. How objects are kept within private spaces determines their personality too. 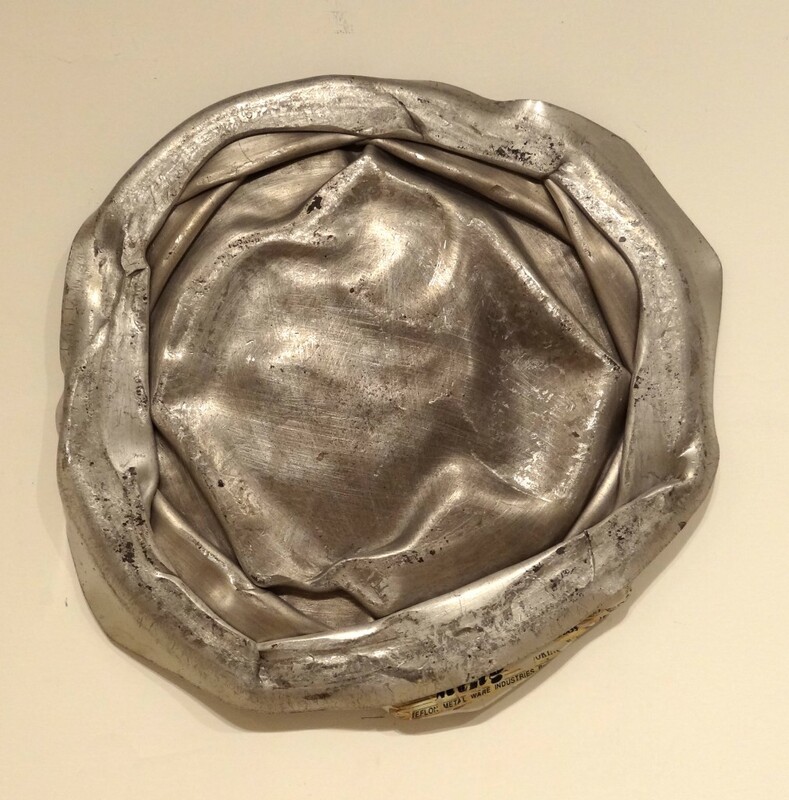 Hifsa Farooq, re-contextualizes the household in this show; the function and meaning of its objects escape their previous value and evolve to something new. Her work interplays with iconic forms of articles associated with local middle-income family homes. The dislocation of these articles from their predictable environment offers new connotations and layered meanings to the work. Farooq changes the demographics (size, shape or function) of homemaking objects and brings new content to old forms. Compressed and deformed robust aluminum cooking pans (diagcheez) suddenly detach the viewer from their usual domestic utility. The (apparently sturdy and unbeatable) metal forms, now appear as malleable metallic dough ready to be kneaded or rolled on, to make round chappatis. But these objects do not become dysfunctional, rather they reveal a broader identity. Robbed off their previous function, the objects become a memory of their past. Metal shelters (teen ki chatein) commonly used as rooftops for temporary shelters and habitats are cut into unified square fragments and placed as wall ornamentation. Symbols (otherwise) of insulation and protection, these forms now become their counter narrative – as fragmented, dysfunctional, unviable, rusted and worn out material adorning walls, instead of fortifying them. For Farooq, “Home is a like world within a world”. As a child, she says, she would “often observe the mundane of home: her mother making chai, her father leaving his briefcase in the same spot each day, the dust collecting on spaces less frequented, and the heated debates and arguments at the dinner table”. For her, this work is about intangible structures that “sit beneath the surface of home”, thus exploring the “politics of domestic space and the power dynamics that exist within it. Fairly implicit in Farooq’s work is a struggle to understand the nature and shift of power among people living under one roof; to understand the dichotomy of their beliefs, individual realties and concepts about submission, care, interdependence, commitment, and responsibility. 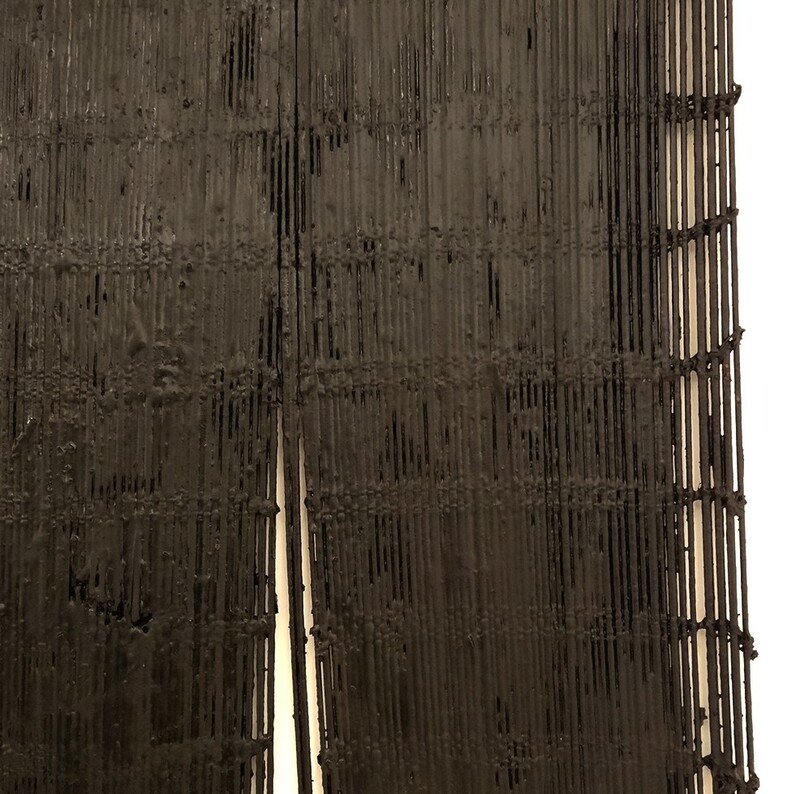 Dipped or coated with thick layers of bitumen or tar, large cane blinds (chikh) snarl at the viewer, almost aggressively owning to their transformed identity. Tar is usually associated with concrete and oil used for road surfacing, coating and roofing. A black viscous mixture of hydrocarbons acquired naturally or as a residue from petroleum distillation, it is sticky and gooey – hence undesirable. Yet its relation with oil makes it insidiously rich, penetrating and powerful. This material too has political connotations; it points to capitalistic commodities and tar sand/ oil sand enterprises seeking global attention. The mediums and materials that transform Farooq’s objects’ are powerful, masculine and fierce. They supplement the friction as well as the eternal connect and balance between masculinity and femininity and undo the symbols linked with them. Sara Aslam works with self-sustaining habitats. Currently a graduate student at SVAD-BNU, the work stems from her undergraduate thesis interests in planting and cultivating. She makes ‘living art’ by creating a nursery of homegrown medicinal, edible and ornamental plants. (din ka raja), dry leaves, herbs and ferns in glass jars. 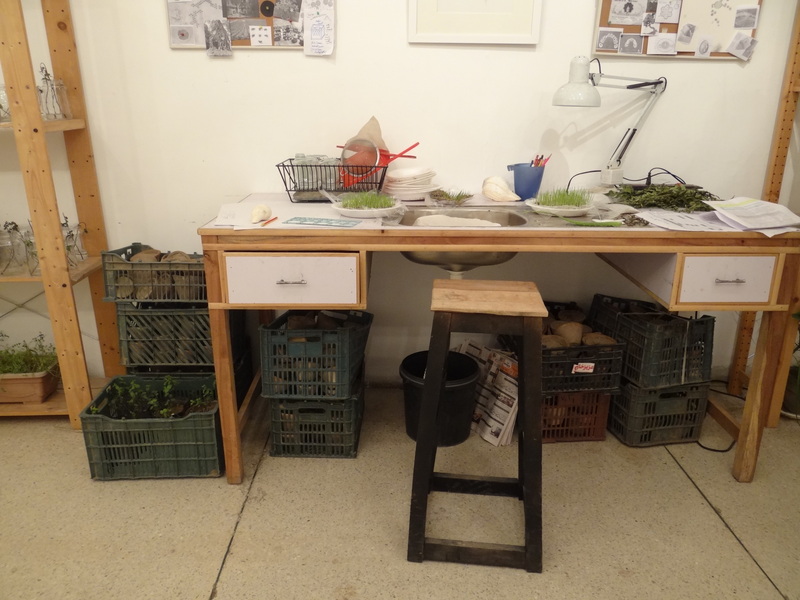 In her Forms from Garden, she creates an intimate space of observation through acts of growing in limited urban spaces. She longs for residential gardens in the city and tries to re-live her old village-home horticulture. This yearning becomes her creative practice as well as a fulfillment of a desire for gardening. Included in the display is a workstation where she experiments with organic material and pastures the thoughts that give form to her work. Her studio space becomes an apothecary of sorts, where she formulates and dispenses her ‘art supplies’. Like a juvenile agricultural scientist, she creates an illusion of tillage over concrete flooring and grows wheatgrass on it. 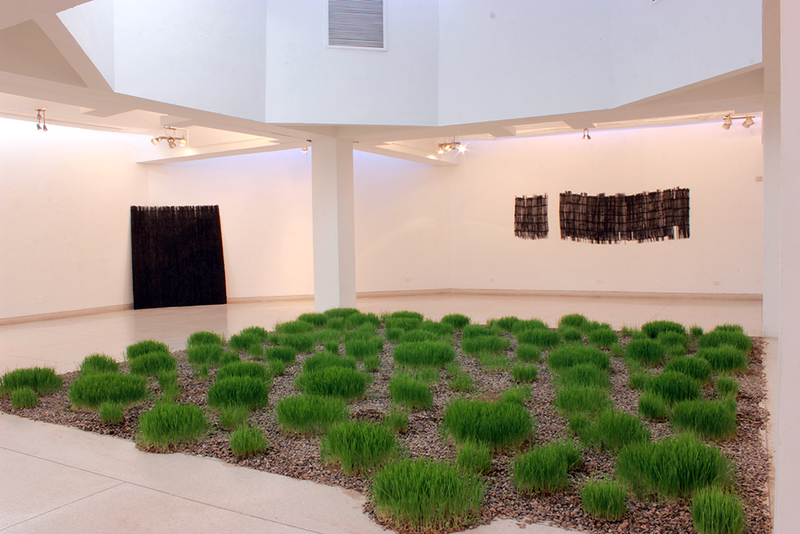 This wheatgrass field installation is an extension of her garden at home, she says. In her (art gallery) homestead she has grown asparagus, ficus microcarpa, snake plant, peppermint, tomato, aloe vera, beaucarnea, basil, american fern, schefflera, sansevieria and curry leaves, to name a few. Most of the viewers were unfamiliar with this new visual diction and kept snooping for information from the artist. Fortunately, Inaam Zafar, a visual artist (a botany maniac and a well-versed plantsman) visiting the gallery at the Opening, filled us in on the variety of vegetation on display. To the ‘outside’, artists are usually perceived as exclusive and cocooned. However, this show bought together an inclusive audience; stage drama artists, musicians, visual artists, non-artists and pedestrians lounging at leisure at the Arts Council. It is an achievement and a noteworthy signifier of artistic success to be able to connect with and easily communicate your ideas to the periphery, let alone to an audience devoid of ‘Visual Arts’ education. The two-person show with its artistic ferment, managed to eliminate barriers between the audience and the canvas. There really was no canvas. Farooq and Aslam develop their creative bend towards a unique language of domesticity and habitats; sensitively interpreting the idea of home – taming the familiar to become the unfamiliar, and the comfortable to become the uncomfortable. Their modest acts of cultivating, nurturing, de-shaping and re-functioning in a public gallery sensitized many aspects of place-making for its viewers. With their inclusive language and a fresh approach to making (which is still struggling and nudging its way in the country), the artists have set high expectations for themselves, and us, for future; a notch up – for the artists, the art space and the local creative circles.